The Journey continues to Corky's "Wood-Fired"
anticipation of re-opening a new Corky's in Naples, Florida. I thought to myself... "this time I will keep things simple by not expanding the location or the menu, such as I did in Connecticut." I searched for a location in Naples, FL. where I had been living since I retired in 1995. My plan did not materialize the way I anticipated. as I thought... I couldn't seem to find a location that I was comfortable with. Then it happened... On January 28, 2001 I met Michele from Arlington, Texas. Now my journey is about to continue in Arlington, Texas. After a while I felt led to re-locate to Arlington, Texas to be with Michele and continue my search for a location. Soon it was evident that this is where I was meant to be. I found a very nice location in no time at all and everything fell into place. similar to the one I first opened in Connecticut in the 70's. 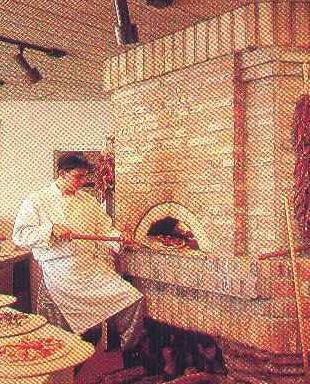 on the “open hearth” in our Custom-Built, Authentic Old World Wood-Fired Brick Oven. We'll also serve Garden Salads... Appetizers... Desserts and Beverages... and YES YOU MAY BYOB. the way it used to be... and I look forward to y'all stopping by to "break bread" with us at the new Corky's in Arlington, TX. Bring the whole family... After all... there's nothing more important than family and friends. our son Andrew (Night Manager) or Andrew's significant other Jerushah . I truly do believe that "Strangers are merely Friends that we haven't yet met". if there's something you're unhappy with, PLEASE tell Michele or me. If you're happy with everything... please tell as many people as you can. If you're unhappy about anything please tell me.